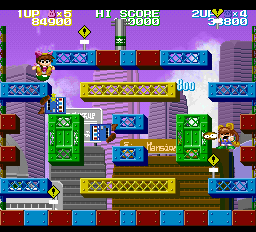 Chip Chan Kick is a platformer game developed by Cybertech Custom and released in 1996 for the PC-FX, NEC's Japan-exclusive successor to the PC Engine, unsuccessful competitor to the Sony PlayStation and Sega Saturn, and NEC's last home video game console. 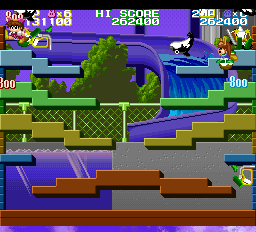 Chip Chan Kick is an elimination platformer in the style of games such as Snow Bros., Bubble Bobble, and Parasol stars. 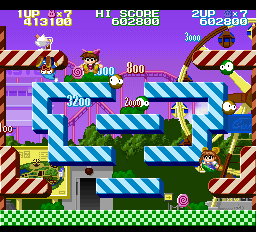 The player characters, Chip and Chap, are stuck on a screen filled with enemies; by defeating them all, and collecting their powerups and bonus objects, they progress to the next screen with more enemies, and rinse and repeat. The game has six worlds with ten rounds each - the first nine rounds of each world requires the player(s) to remove all enemies, bonuses and powerups from the screen, while the tenth features a two-phase boss enemy who must be defeated to clear the world. The characters have two sorts of attacks: they can throw companion blobs (called Mosapow) at enemies to damage or stun them, and then when they are stunned, they can kick them away to defeat them. Enemies that are kicked away function like Koopa shells in that they can knock away other enemies. Once they have traveled a certain amount of distance and hit a wall, they bounce into the air at a random angle and leave a bonus pickup or powerup upon landing on a floor. Because in order to progress, all enemies as well as all pickups must be removed, this creates an interesting optimization challenge where the characters must not only defeat the opponents fast, but also must be able to retrieve their powerups as soon as possible. With enemies bouncing all over the screen, this leaves some interesting results. Chip and Chap are outside kicking cans one day. Chap kicks a can away and accidentally hits a mysterious rock with it, which turns out to actually be the prison of evil dark lord Warbit who is inadvertently released from 100 years of being sealed away. The goddess in charge Ariena swoops in to seal Warbit back in, but Warbit already released five of his enforcers (named Maron, Mily, Muna, Mel and Moly) who are wreaking havoc around town. Ariena grants Chip and Chap the Mosapow and catgirl and raccoon-girl forms respectively, and Chip and Chap are tasked to stop the five enforcers and retrieve their gems while Ariena holds back Warbit. Five defeated enforcers later, Warbit defeats Ariena and turns the world into darkness, and Chip and Chap have to stop him once and for all. Chip and Chap defeat Warbit, happy ending, yay! (That's what I could piece together anyway from the (mostly fully skipped) cutscenes, and Japanese online descriptions). Left and right movement are a fixed 1px per frame, or 2px per frame with the speed powerup (which is very quickly obtained by both characters for obvious reasons). Jumps are limited to four different arcs (hold jump for 1-2 frames, 3-4 frames, 5 frames, or 6+ frames), three of which are quite low, and one very high one. Any time more than half a character's height of jumping is needed, the character is forced to do a maximal jump, which makes jumping look somewhat slow. This is a limitation of the game. Characters have one Mosapow by default, but can collect a second one by powerup. If they have two, then the second Mosapow can be thrown 8 frames after the first. Aside from that, the player needs to have at least one Mosapow next to them to be able to throw one. How long this takes varies depending on where the Mosapow hit its target and where the player moves while it is out. 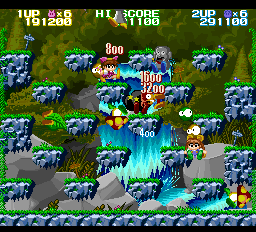 When throwing a Mosapow, it is released 8 frames after pressing the button, and it is released in the direction the player faces on that 8th frame. This is useful information for when the player throws a Mosapow while moving backwards. The RNG in this game is pretty unfriendly, and manipulation for it is quite limited - this is pretty annoying considering it is a crucial element that comes up a lot. Enemies move in random directions and randomly jump up or fall down platforms, enemies bounce off walls at random angles, and the pickup types they drop are also random. The RNG is not frame-based or input-based, and can only be changed by forcing enemies to do different actions (either by making use of their AI if they have certain actions, or moving in a certain position near them, or stunning one so they don't perform a move, or damaging one so they are forced to perform a move) or by bouncing enemies off walls (which is what we're doing most of the time, anyway). This means that many times it looks like some bounce result or something similar could be done better, but it actually is limited by what the game can offer through the RNG. Something you won't actually see in the run, but is very relevant behind the scenes, is the EXTEND bonus in this game. If a certain character defeats a certain random enemy (generally there's always one "active" enemy per stage), a bonus jingle will sound and six balloons appear from the top of the screen, each holding one letter of "EXTEND", and the balloons drift upwards in a fan pattern. If a character collects all six types of balloons (they are stored between rounds and stages), they get a 1-up. Sounds nice enough for a casual player, and not really harmful in any way, but for the TAS it's a significant time loss - the balloons provide extra powerups that need to be collected, and their fan pattern rising from the bottom pretty much guarantees that there is no fast way to pick them up. Therefore, EXTENDs are always avoided throughout the run. Which enemy character is the "EXTEND"-trigger can vary as the RNG is incremented, and it is never triggered by enemies defeated from getting Koopa Shelled by other enemies. This does mean that quite a few times, strategies had to be changed in order to avoid EXTENDs from randomly appearing - generally speaking, if it looks like a player goes past an enemy that it obviously was in range to kick but didn't, then chances are it was because it would have triggered the EXTEND bonus. 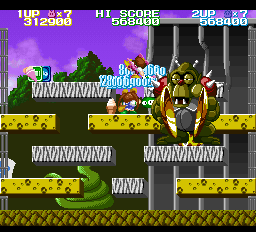 The game does not really lag in most places, but in a few areas it is very significant: the Stage 1 boss (Maron)'s second form, when it fires a lot of missiles, and all the Stage 6 rounds (especially the nine regular rounds). This is frustrating not just because of optimization reasons, but also because it was prone to causing desyncs if I tried to multitrack between the two players. The lag in the Maron fight is minimized by using all resources (enemies) to defeat the second phase as possible, rather than using the enemies on the first phase. Bouncing an enemy into a boss deals 3 damage to the boss. This is useful against most of the girl enforcers, as it is the only way to deal more than 1 damage at a time to them. Normally, a boss turns invincible for one second upon getting hit, and is unable to be hit during invincibility. For the five enforcers in their girl forms, this is a fixed rule - however, for their mech forms and for both phases of Warbit, invincibility can be bypassed by hitting the character a few frames after their invincibility was triggered, which causes it to reset. They can also take multiple points of damage at once by being hit by multiple things in one frame. By making use of double Mosapows, strict coordination, timing and spacing, it is possible to hit an enemy four times in one shot using both characters, or twice with one character. This greatly speeds up the affected boss battles - especially Warbit himself, who this way is defeated in a quarter of the time it would normally take to defeat him. I manipulate speed powerups for both characters essentially as soon as possible. Chap gets one in 1-1, and Chip in 1-2. This is the most crucial powerup for each character, doubling their horizontal movement ability. Chip also gets a Mosapow in 1-7. Maron's first form has 18 HP, and second form has 27 HP. Maron's second form (bird mech) is extremely laggy when it starts firing missile spreads, to the point that it's worthwhile to destroy it as fast as possible before it gets too many shots off. To this point, all enemies are conserved and assembled into one big row so they could be shot into the mech as soon as possible. This does an immediate 6x3=18 damage to it, and the remaining 6 is cleared off in two rounds of triple hits. Mily's first form has 18 HP, and second form has 39 HP. It was barely impossible to defeat enough enemies in time to force Mily to summon new ones, due to how the stage is laid out and both characters being necessary to damage her and kick enemies at her. Defeating all enemies would require one of the characters significantly going out of the way, which would lose more time than it would save. Muna's first form has 21 HP, and the second form's halves have 30 HP each. For the first couple dozen of frames, while both mech halves of Muna's second form are still fused together, they both take damage from a single hit - the bunches of enemies that are kicked into them both deal damage to both halves, dealing 36 damage in total (18 to both halves). This causes both halves to take a big chunk of damage right off the bat, resulting in a pretty short fight. Mel's first form has 21 HP, and the second form has 45 HP. Mel's second form starts on a platform, and it is a lot harder to get enemies up than it is to get them down (as they have to jump up by themselves). I managed to pull it off to the point that five out of six enemies got high enough, but one of them just could not make it in time. Fortunately, this ended up being inconsequential - Mel's second form's first move is to spawn several mini enemies, and spawning these enemies is required to deal enough damage to defeat Mel in the next hit. The one unused enemy would not have been able to save a hit. Moly's first form has 24 HP, and the second form has 36 HP. The background graphics of the rounds here look like they were heavily inspired by EarthBound. They also cause a lot of lag in all rounds - the only one that does not constantly lag is Warbit's round. This made this world that much more frustrating to deal with than the rest. Warbit has 68HP. He enters his second phase after taking 33 damage, but both phases share their HP and compounded damage on the last hit of the first form does carry over to the second. This userfile is identical to the submitted file up to the submission file's end, but includes adding player names after the credits. I recommend using this input file for publication encodes. Also, as the run contains a lot of 30Hz blinking (the main characters are both invincible around half the time, as well as bosses who are constantly getting hit), I would recommend doing something for deblinking for the YouTube encode to keep it watchable when played back at 30FPS. Thanks to natt for bringing forth TSTHawk allowing me to create this run. And thanks to the rest of the BizHawk developers who I occasionally bugged at the time too. Masterjun: How can 2 player runs be real if people only have 4 limbs. I mean judging. Masterjun: While this game sounds like it would get repetitive, there is actually a lot going on in every round and you don't get bored due to the fast-paced action. 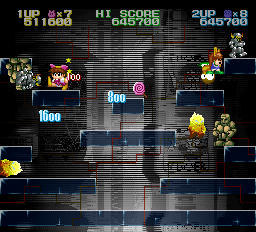 The run itself looks really optimized, collecting all the final items with both characters at once. There is even entertainment put in here and there. With this in mind I see no problem with accepting the run. fsvgm777: Suddenly, PC-FX is a thing.